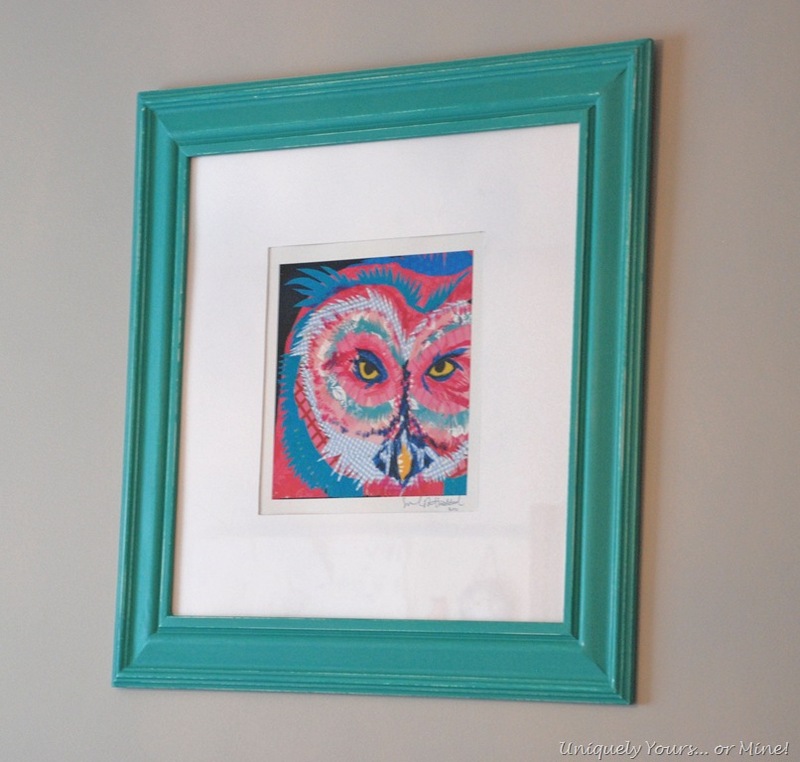 We Finally Finished Brie’s Room – Uniquely Yours… or Mine! 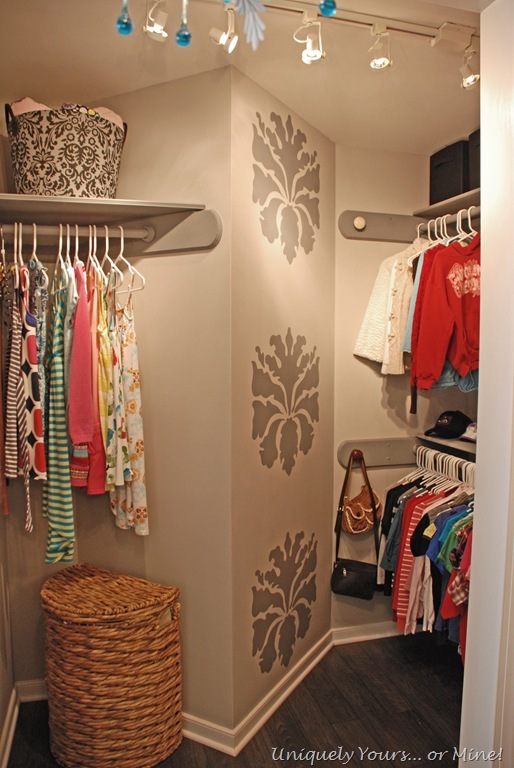 I won’t go into details on how we updated this closet into a dressing room, but please check out the details here if you’re interested, it’s a pretty cool transformation if I do say so myself. 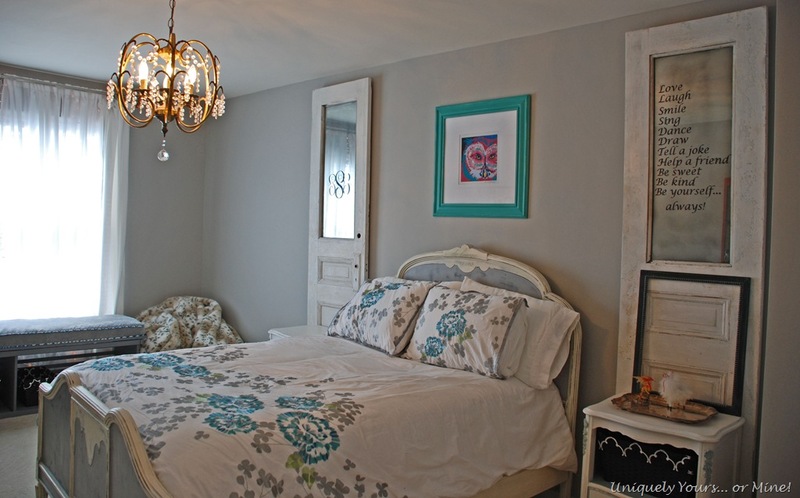 We painted the room the same soothing Farrow & Ball Pavilion Gray that we painted our oldest daughter’s room. I love this color so much I’m pretty sure I will be painting rooms in the new house this color. 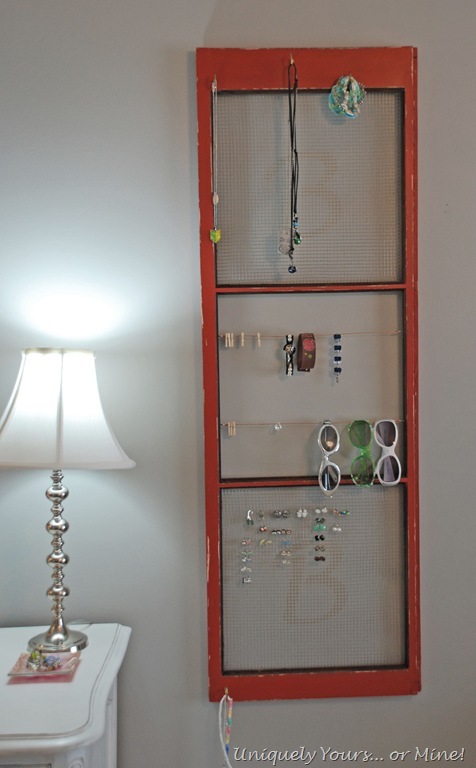 I made this jewelry holder for her from a vintage cabinet door and painted it a custom coral color ASCP. 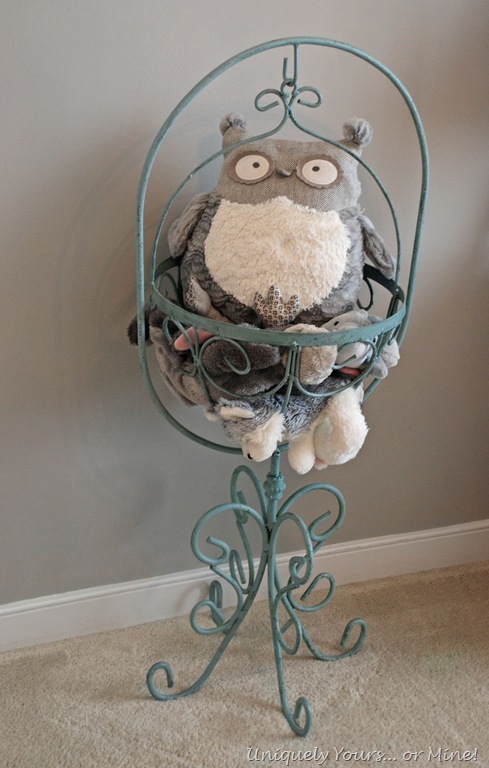 And I just adore this vintage plant stand that I painted Duck Egg, it’s perfect for holding stuffed animals. This is like 1/100th of the stuffed animals this child has, but as part of the decluttering I packed up all but these, let me tell you she was THRILLED! 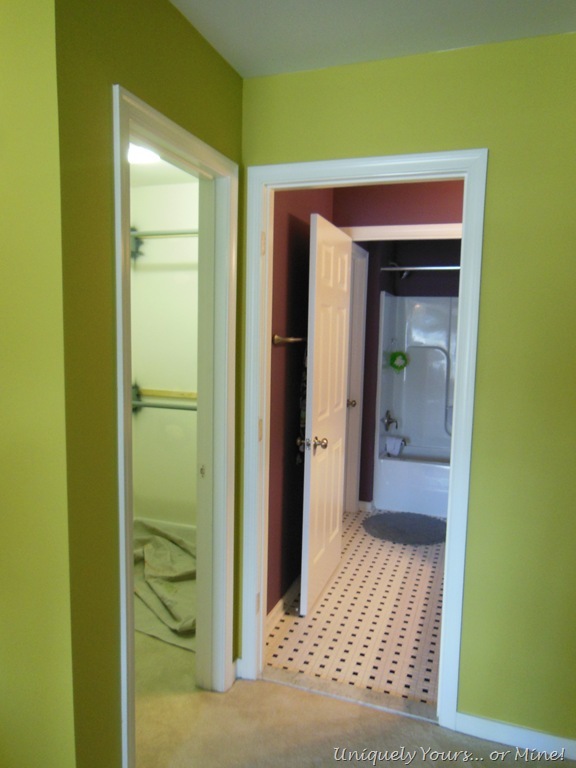 Here you can see where we worked in the vintage French doors into her décor, as funny as she was about these doors she really likes them now… WHEW! As much as I don’t like seeing all of her “crap”, Brie does, so if I have to see it at least I can put it on a cool rustic shelf right? This was an old store display, I just cleaned it up and we attached it to the wall for stability. The cork board is for her to display some of her drawings, she draws A LOT and is very good so I do love seeing them displayed! 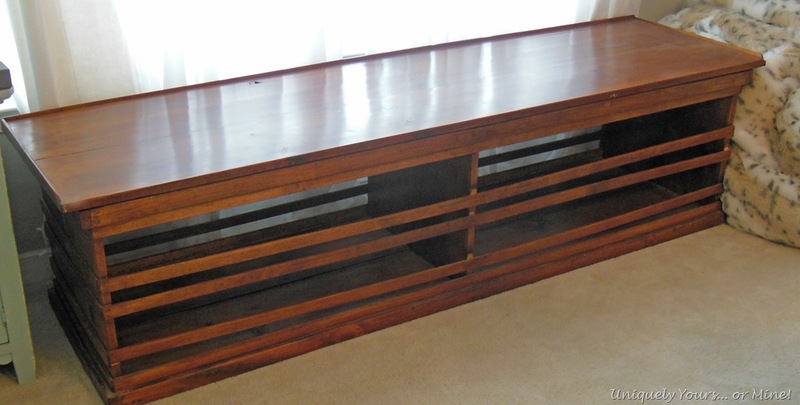 This was the last project I needed to finish before sharing this room with you… I bought this great bench at auction, we made some modifications, painted it and made a cushion for it. 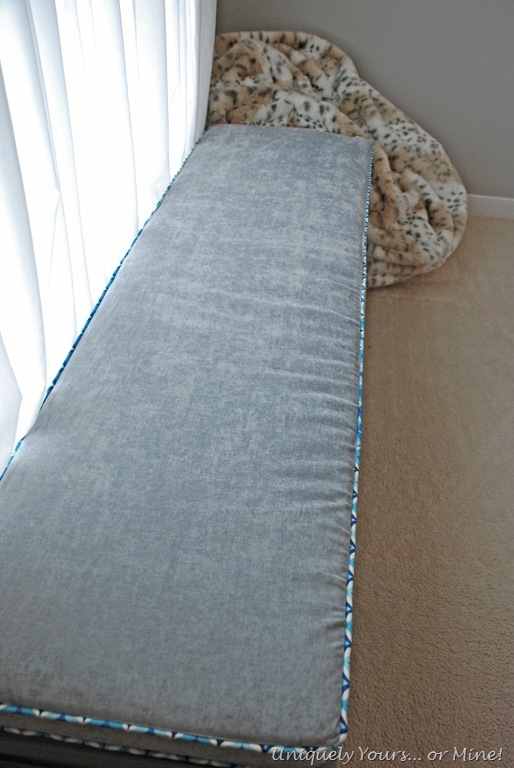 Now it’s the perfect window seat with a removable cushion. I will tell you I put off this project as long as I could as I dreaded sewing the cushion… I did a pretty good job, but I’m still no seamstress! This is the view from the far side of her room, you can see her fabulous new dressing area and into the shared Jack and Jill bathroom. When she has friends over they love to close the curtains and play in the dressing room! 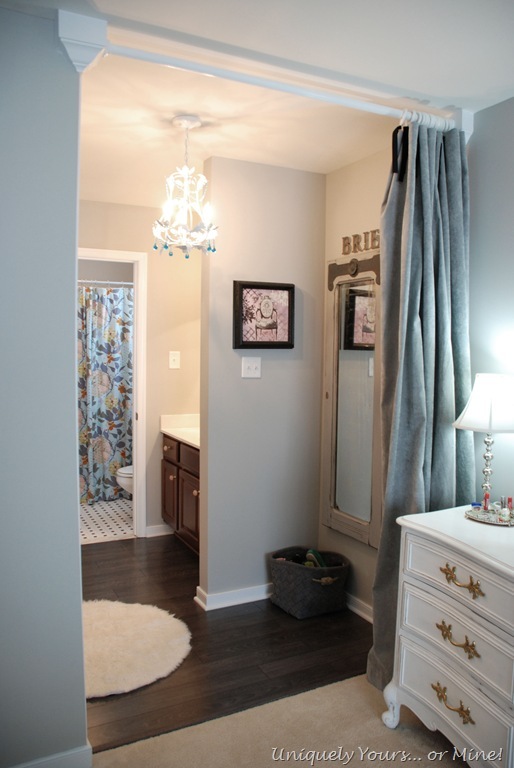 Last but not least is the bathroom area she shares with one of her sisters. 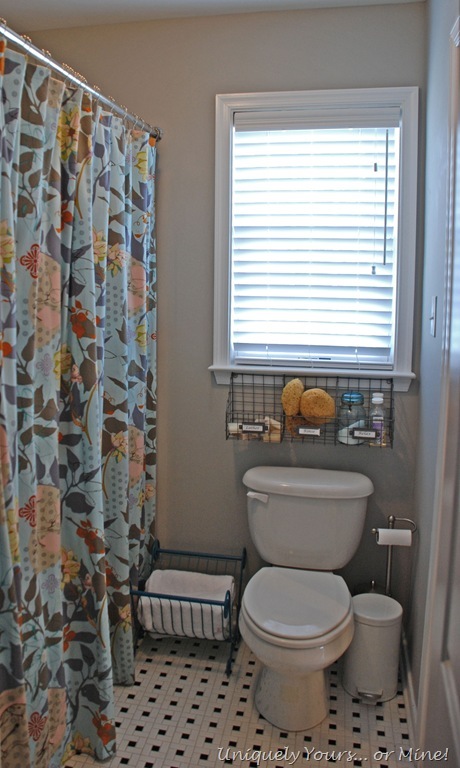 I made the shower curtain before we even moved into this house, as shower curtains are pretty easy to make and I love the custom look you can achieve with one. I love this little “spa” area I have set up for them… and it’s not just for show either, they really use this stuff, doesn’t it look pretty too though? 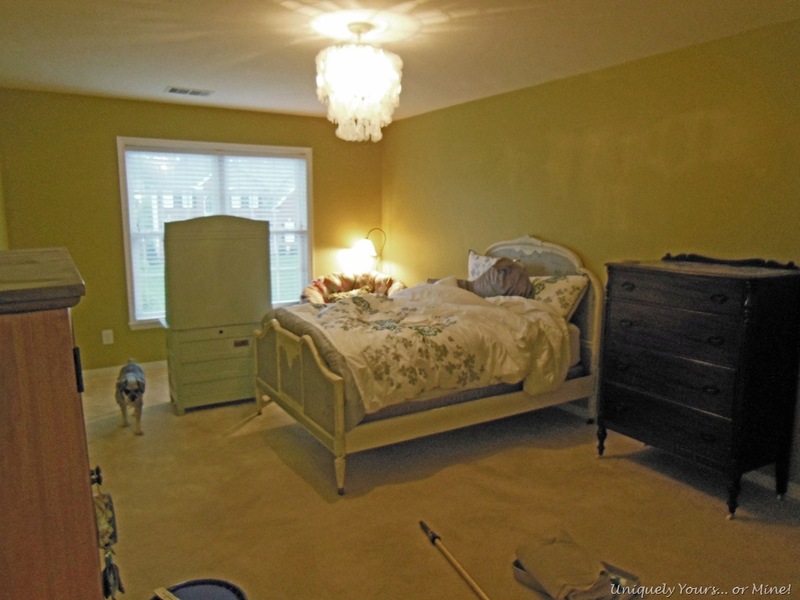 So that’s Brie’s new bedroom, dressing room and bathroom! I hope you enjoyed the tour! Thanks as always for stopping by, hope you come back soon! Linking up to these great parties! no worries that my tag-along didn’t work this week — the news that you’re moving makes me realize how busy you are and are going to be! just let meknow if there’s ever a time for me to look over your shoulder — and i’ll be there! also, look forward to meeting you at the ORANGE potluck on 8/9, if you’re still around! have a great weekend, steph. It’s beautiful! I love that gray. I’m looking for the “perfect” gray to paint in our new house. I’ll have to add this to list of possibilities! Thanks Andi! It really is the perfect light shade of gray! 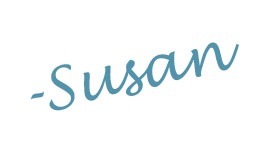 Oh Susan everything is just gorgeous !!!!! 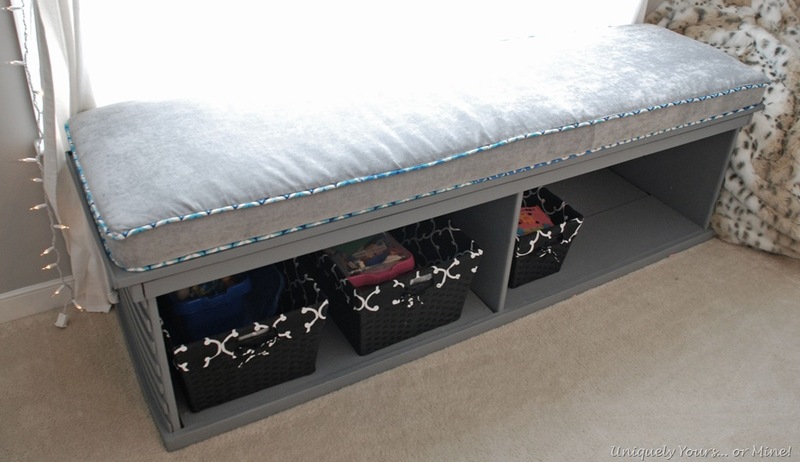 That bench – you actually put piping on it and then say ” you’re no seamstress “???? Really I just love everything in that room – what I wouldn’t give to have Brie’s dressing room! Thanks Suzan! 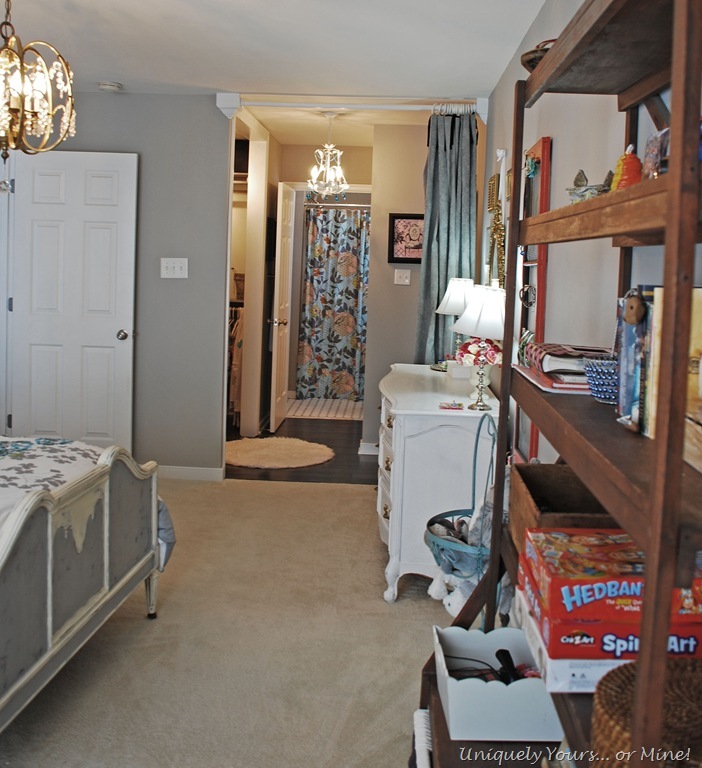 I love her dressing room too, I’m hoping to recreate something like it for me in our “new” house! That’s so cute! and if you can do piping, your a seamstress…trust me! I literally hated my sewing machine so much (cuz of that stupid bobbin thingy and I had arguments, literally!) that I sold it for 2 bucks at a yard sale just to get even! 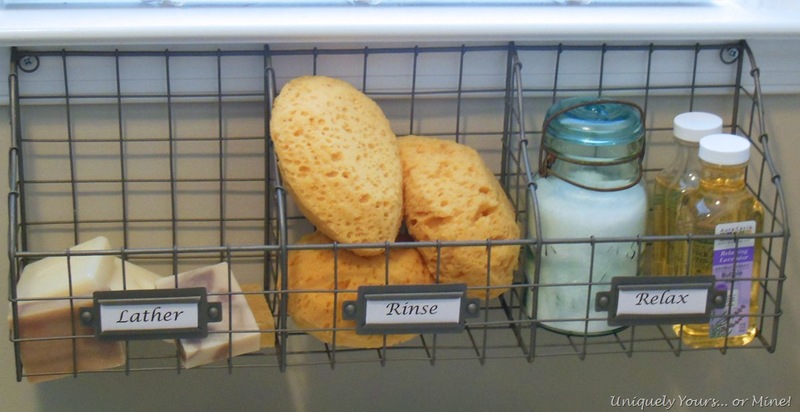 Love the wire shelf with the cute tags on it….the whole room is adorable, good job! Thanks so much Christine! I really can sew the heck out of a straight line and I have some mad piping skills but that’s about it! Just gorgeous! I love the gold accents in the chandelier and mirror. So elegant! Thanks so much Jennelise! I’m particularly fond of the chandelier, it’s vintage and reminds me of Cinderella’s carriage! Beautiful is the word! Lovely space you got here. 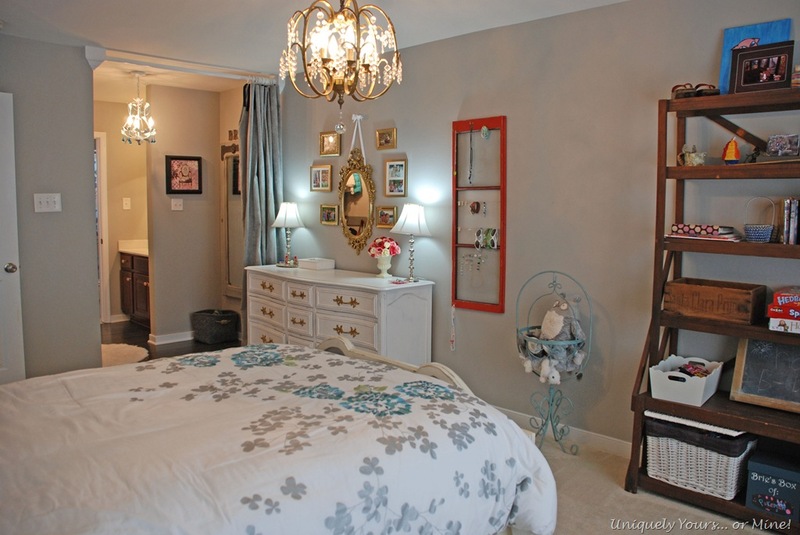 What a gorgeous room & I adore that gray on the walls! I’m featuring it in the PoPP Spotlight this week. Thanks for linking up. Susan it turned out just beautiful! Thanx for joining THT. What an amazing transformation! I love the details and the turquoise and well just about everything!! Thanks so much Brooke! Now I have to do it all over again when we move.. Yay! 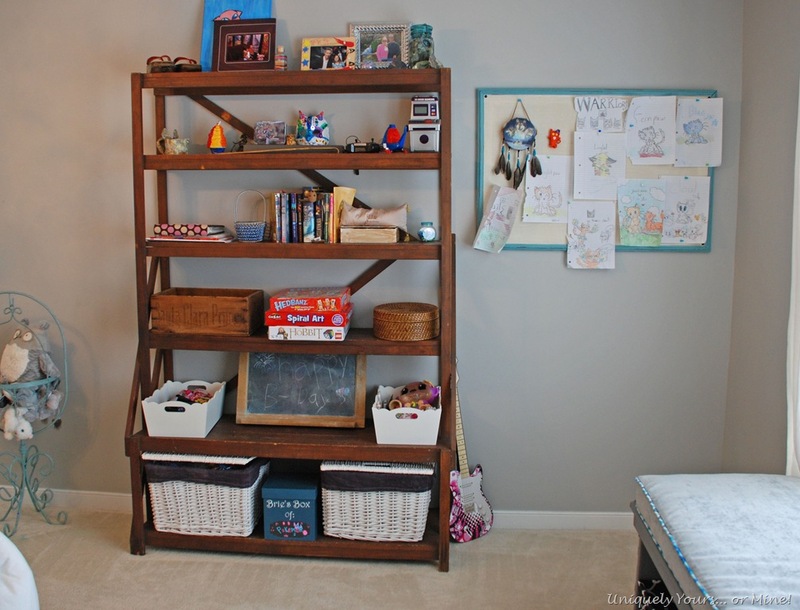 Pingback: Finding Gray & Updating the Family Room | Uniquely Yours... or Mine!